This is a really good-looking device, its curved display offering a real feeling of elegance and class. However, the screen is actually really disappointing. 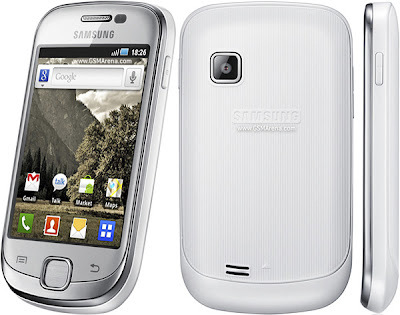 Anyone who's after a smartphone but who doesn't want to splash out the sort of cash required for the Samsung Galaxy S II (or indeed try to squeeze that in a pocket) could set their sights on a budget device instead - the Galaxy Fit, for instance, which is small in both size and pricetag. The device has a simple design, with a glossy black frame around the display. Plus, there's a central direction pad and for menu and back a pair of virtual buttons are provided. It feels pretty lightweight, but still gives a decent ‘heft' when you hold it, and the back cover has a subtle texture that feels good in the hand too. The Galaxy Fit also looks pretty good. The flush display on the front of the device means that it offers a really tactile experience. There is no frame around the screen, so the phone feels really smooth. Along with its subtle curves, this gives the handset a high-class, quite luxurious feel. When you want to wake up the display, you simply touch the home button, which you'll find on the right edge of the device near the top, as is usual with Samsung handsets. A light touch and the low-res display jumps into life - and spoils the elegant look of the handset. Another downside is that the device's pair of virtual buttons don't light up - so if you happen to be in a darkened room, you'll have to remember where they sit, which can be irritating at the best of times! Now, knowing the price as we do, we should have been prepared to see corners cut - other budget Android handsets come with resistive displays or don't have Wi-Fi. In the case of the Galaxy Fit, Samsung has opted to include a low-res capacitive display and a seriously slow processor - just 600MHz - which seriously affects performance speed. Okay, so Samsung isn't expecting the handset to do anything out of the ordinary - it can't handle a lot of the animated wallpapers seen on Android device, for instance, so there is only one on offer - far better than including lots of them and choosing one, only to watch it chug slowly through the animation. What is quite surprising is that despite its low price tag, the handset does actually boast a pretty decent five-megapixel snapper - there's no flash but we'd rather see that than a mediocre flash and a low-res sensor. Not many camera phones take decent images in low light, and flash generally just bleaches out detail. So as long as you take pictures in good light you'll get some decent results. The Android operating system has been designed to operate on all kinds of displays with different resolutions and sizes, and it can look excellent - especially on Samsung's AMOLED screens. But it's rather disappointing on the Galaxy Fit's screen. However, it is Android Froyo, so is a pretty recent version of the operating system - even if it's not the very latest one! And anyway, many of the differences between this and the latest Gingerbread version (such as NFC support) are not relevant for the Galaxy as it lacks the hardware. Mind you, looking at Android on the disappointing display may put you off it completely - especially with that sluggish processor. And Samsung doesn't add much to the Android experience - unlike HTC. Nor is there much in the way of Samsung apps - and those available aren't much to write home about. But, bearing in mind that this is a budget smartphone, it still has plenty to commend it - even though there are rivals such as the HTC Wildfire S that can do some things better. As we've already said, the Galaxy Fit is not going to be able to compete with the high-end smarphones, but it is a neat and well-priced device. It is good looking and works well, even if it is a bit slow sometimes. For anyone planning to upgrade from a basic handset it's worth considering if you are on a budget and have small pockets. However, you could splash out a little more and get a far better handset with a higher-res display.